Gemini Arabians made it four in a row in the Masters Champions League thanks to Virender Sehwag’s 63-ball 134, which helped them post a mammoth 224/7 against the Sagittarius Strikers. In response, Strikers never looked like winning, but still managed to stay in the game until the end, as they lost by 12 runs. Although his opening partner Jacques Rudolph got out, Kumar Sangakkara, who was averaging 92 in the tournament, prior to this game, gave Sehwag good company. While the Sri Lankan was playing second fiddle, Sehwag brought up the fastest hundred of the tournament as he smashed his ton off just 47 balls. 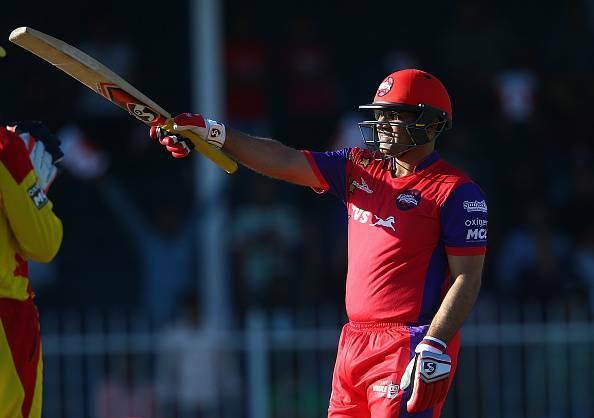 Just as Sehwag was looking set for 150, he got out, but not before Sangakkara notched up his third fifty of the tournament. But arguably the biggest talking point from the innings was the final over bowled by Krishmar Santokie. Not only did the West Indian fast bowler pick up four wickets in four balls, but he ended the over having conceded just 1 run and taking five wickets as the Arabians collapsed from 223/2 to 224/7, thereby falling short of the highest score of the tournament, which they themselves set. In response, Strikers got off to the worst possible start as they lost their captain Adam Gilchrist for a duck and Mahela Jayawardene followed soon after. By the end of the powerplay, although they had notched up 56 runs, they had also lost three wickets. With the target looking a long way away, Imran Farhat and Yasir Hameed set about bringing that closer. Although Hameed was living a charmed life, he was also smoking the ball out of the park. Soon after getting to his fifty, Farhat got out and that prompted a mini-collapse, which saw them lose five wickets for just 28 runs. When the eighth wicket fell for 158, it looked as though the Strikers might be thrashed. But Yasir Arafat smashed a few out of the park and Krishmar Santokie, their hero from earlier, also hit a few to ensure that the margin of victory for the Arabians was just 12 runs. But that should take nothing away from the Arabians, who are simply running teams in this tournament and have emerged as strong favourites to claim the inaugural crown. Brief score: Gemini Arabians 224/7 in 20 overs (Sehwag 134; Santokie 5/30) beat Sagittarius Strikers 212/9 in 20 overs (Farhat 51; Muralitharan 3/38) by 12 runs.